In the 17th century, Dirck de Bray wrote his short lessons in bookbinding. This book is an 17th century illustrated guide for binding leather and parchment books. 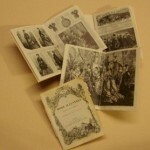 He describes the art of bookbinding and illustrated the text with drawings of the various stages of the binding process. The hand sewn book block of this book has twelve sections. The color of the leather cover is varies. This book is a facsimile edition of Bloem-Hofje written by C. Van Lange in 1674. made by B. Smidt. 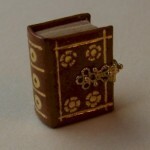 Like the original, it is bound in a light brown leather cover with goldleaf stamped lines and flower motifs. On the spine of the cover there are goldleaf stamped circles. It contains 25 pages. The text was printed in double spreads on one side of the paper. 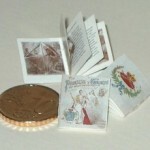 The bookblock is concertina folded and pasted together to give the appearance of normal leaves. The 18 karat golden flowershaped clasp is made by M Niemeijer. Benedikt Smidt was a printer from Middelburg. 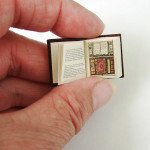 He probably produced this mini miniature as a show-piece to demonstrate his technical ability. 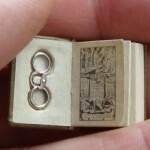 This tiny book has a limited edition of only 20 copies. The first three books in Latin, of the complete works of Vergilius Maro (70 v.Chr.-19 v. Chr.). Bound in Olive-green- or chalkwhite leather, with a white golden lorgnet in the cover. The lorgnet is made by Jens Torp. The bound bookblock contains 88 pages. The Koninklijke Bibliotheek gave their full support for using the original engraved titelpage for this book. Jan Minell (1625-1670) and Pancratius Maasvicius (1658-1729) were responsible for the design and engraving of the titelpage. The original book is published by Drukkerij Wetstein in Amsterdam in 1730. A wonderful first edition of “La mode Illustreé” from 1874, a French fashion magazine published in Paris. A weekly that appeared on Sunday with beautiful etchings of fashion, styling-details and hairstyles for women. Slighty coloured through the years, though hardly damaged because the ladies handled their favourite fashion magazine with great care. 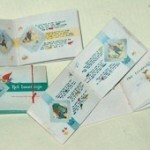 Piggelmee, Het tovervisje, ( in Dutch ) offset printed. The book is bound en will be delivered in a cassette with the illustration of the coverpage of this book on the frontside.